Global pressure patterns are a function of spatial temperature variations. We use weather maps to show spatial pressure variations and through analysing atmospheric variables such as wind speed, wind direction, barometric pressure and temperatures, meteorologists are able to predict weather patterns. In this article, I will discuss how cyclones are formed and their associated weather conditions and land sculpture processes. The general atmospheric circulation mainly describes wind motion. Geostrophic wind motion is a function of vertical pressure differences that create a pressure gradient force. The pressure gradient force causes air to flow upwards, resulting in cross-isobaric wind but it tends to be balanced by gravitational forces which directs wind downwards. As air flows along two points of different vertical pressure, a Coriolis force creeps in and it has a tendency to deflect wind at a rate proportional to its speed and latitudinal angle. The Coriolis force is greatest far from the equator and it is this force that creates centres of low pressure, often with in-spiralling high speed wind. Wind speed is therefore a function of pressure gradient force, a Coriolis parameter and the sine of its latitude as well as the density of mass. High speed air masses associated with cyclones often travel at speeds above 90km/hr for normal cyclones but may become severe, traveling at speeds up to 280km/hr or more. A cyclone is therefore a low pressure cell that creates a high speed air mass originating far from the equator and associated with in-spiralling clock-wise airflow in the Southern hemisphere and anti-clockwise airflow in the Northern hemisphere. Depending on their origins, air masses are defined as continental air masses for those originating on land usually in the tropics and maritime air masses for those originating over oceans. Air masses originating over seas have a high moisture content and are associated with atmospheric instability, resulting in thunderstorms that leave a trail of destruction along the path they travel. The high speed wind associated with these thunderstorms have resulted in cyclones being called typhoons and hurricanes in some regions. During an El Nino year, cyclones are more likely severe and frequent in Southern Africa and Australia because of the Southern Oscillation Index, a net off in barometric pressure between Darwin and Tahiti meteorological offices in Australia and Peru, respectively. Because cyclones are predictable, the World Meteorological Organisation Hurricane Committee gives every impending cyclone a name usually drawn from the Greek alphabet. Cyclone Idai originated from a tropical low pressure cell that formed off the eastern coast of Mozambique on March 4 and reached a peak with winds travelling at 195km/hr and a central pressure of 940 hapto-pascals. Very high rainfall intensity was recorded in Mozambique and Zimbabwe Eastern highlands as well as some parts of Malawi, leaving many people dead, homeless and displaced. Approximately 3 million people were affected with a death toll of over 700 people according to the UN. In the next section, I will deal with the geomorphic phenomena and processes that pose a danger to humans during a cyclone. In the initial stages of a storm, rainfall infiltrates into the soil and on rock surfaces until saturation is reached. Raindrops then begin to collect in small depressions on the ground surface and we call this depression storage. However, as more and more rainfall is received, overland flow creates shallow streams causing sheet-wash erosion that tends to increase its competence downslope. Slope formation theorists namely DM Davis (1902) who propounded the slope decline theory, W Penck (1956) who postulated the slope retreat theory and LC King (1938) who proposed the pediplanation theory agree that runoff processes are the main causes of mass movement in the seasonally humid tropics. We use a storm hydro-graph to show how a storm increases in its intensity with time. Usually rivers reach a peak discharge within hours after the start of a storm and thereafter flooding begins. River floods mean that a river carrying capacity has been exceeded and discharge begins to flow in the flood plain. Unfortunately flood plains are favoured settlements by peasant farmers and villagers as they provide fertile peneplains suitable for agriculture and readily available water for gardening and domestic use. Due to flooding, rivers erode their streams laterally affecting nearby settlements and boulders rolled on the river bed tend to create a majestic roaring sound as massive rocks are moved downslope, colliding against each other and breaking into smaller pieces in a process called attrition. The intensity of river transportation depends on the point of observation on the river long profile, with vertical erosion dominating in the upper section while lateral erosion and the widening of rivers cause in-channel deposition in the middle and lower channels. A river's bifurcation ratio is used to estimate its flood risk probability with higher order streams and longitudinally shaped drainage basins likely to complicate rescue efforts during flooding. Braided river channels and confluences tend to deceive inhabitants as they gather on elevated parts of the flood plain and leeves that will eventually be washed away as the storm continues. Upslope, catastrophic mass movement processes such as rock falls, land slides and mudflows begin to occur depending on the altitude, posing a danger to downslope settlements. River confluences may reduce velocity causing boulders to be deposited in-channel as what happened at the Nyahode River confluence in Chimanimani where a police station was washed away. Basaltic rock outcrops with large vertical and lateral joints constitute much of the river load and leave disintergrated rocks called blockfields on river beds after the storm. Honourable Energy Mutodi is the Deputy Minister of Information, Publicity and Broadcasting Services in the Zimbabwe Government. 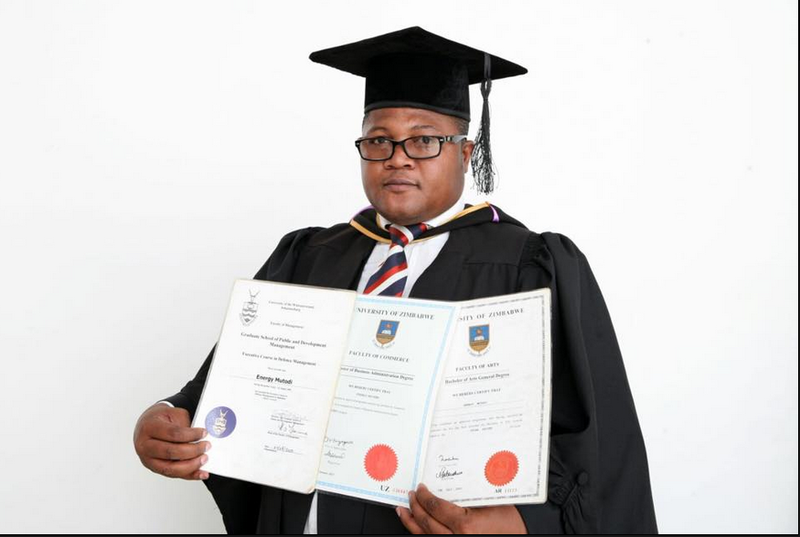 An author in Advanced Physical Geography, Human & Economic Geography, Energy Mutodi holds a Bachelor of Arts Degree in Geography & War Studies from the University of Zimbabwe and a Masters Degree in Business Administration from the Graduate School of Management. He is a doctoral fellow at the University of Cape Town. He is also the Member of Parliament for Goromonzi West.